Fusion of the ankle joint is the fixing together of the two main bones that make up the ankle joint (Tibia & Talus) such that the joint never moves again. Fusion of the ankle is recognised as a ‘gold standard’ treatment for improving the chronic pain of an arthritic joint. It is considered in the situation where all sensible and practical non-surgical methods have failed to sustain adequate quality of life with respect to pain and mobility related to the ankle joint. Arthroscopic Ankle Fusion is a minimally invasive surgical technique that allows us to work inside your ankle joint with ‘keyhole’ surgery techniques. The joint is cleared out of nearly all remaining cartilage and underlying diseased bone. Breaking through to the good bone like this stimulates it to trigger the body into producing new bone, bridging across the joint and fusing the tibia to the talus at a fixed angle. This is much like a fracture / broken bone would heal. The large screws (seen in the pictures) hold the ankle fixed in place for the first few months, maintaining the alignment. The body subsequently unites the bone to bone fusion and the screws become redundant. Arthroscopy ankle fusion has shown very satisfactory technical fusion results in up to 90-95% of cases. However the patient satisfaction resulting from this surgery is a more realistic 80-85%. Dissatisfaction varies from a mild patch of numbness or reduced range of footwear through to major complications dealt with later. What should it be like afterwards? A successful ankle fusion should provide significant improvement in your pain and mobility. Your ankle will however will not be normal. Your mobility improved and hence hopefully your overall quality of life. Comfortable walking can be achieved and in some cases gentle sports. What are the downsides to a successful fusion? With the ankle fused together the other joints in your foot have to adapt and perform movements or functions they were not expecting or designed to do. In the long term the imposed excessive stress on normal foot joints following an ankle fusion can cause arthritis. This can take years but on occasions not many. Your way you walk will change as the ankle is completely stiff. This will improve likely in time but can be permament. What are the Alternatives to an Ankle Fusion? Ankle Replacement (Arthroplasty) – Much like a knee or hip replacement there are products on the market to replace the ankle with metal and polyethylene inserts. The principle of maintaining or even improving ankle movement using these is fantastic but they are still undertaken in relatively small numbers owing to concerns around their durability and indications. If you wish to consider this further do ask. Arthroscopic Debridement- ‘Clearing out’ / ‘Tidying up’ of the ankle has its place as a temporaising measure in certain instances. This will have been considered in clinic and would happily be discussed further if asked. On-going conservative Treatment - This is a quality of life improving procedure and we can of course decide to avoid all surgery at any point. Treatments include painkillers, shoewear modifications, splints/braces and walking sticks, crutches or wheelchair. What is the ‘standard’ recovery? You need to plan a 3 month period of recovery after this operation. It may be a bit quicker than this but on occasions a bit slower too. Many factors affect this. 1st 2 weeks:- You will be in a half plaster cast, resting up and on crutches essentially non-weightbearing. 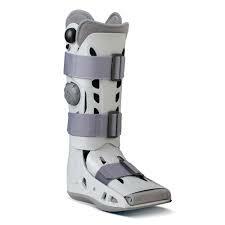 Next 8-10 weeks:- You will be in a removable hard plastic shell boot. Wearing this you will be actively encouraged to walk full weight-bearing. The boot is to be worn day and night, removed for bathing or carefully at rest. Return to daily function at this time (wearing the boot) is often possible. From 12 weeks: You will begin a weaning period out of the boot in to normal flat soled footwear. This is usually a 1-2 week process supervised by physiotherapy. Surgery had to be undertaken with an open procedure through a much larger scar. Your general health and mobility indicates a more cautious recovery. For these and other reasons it is possible you may be kept in cast for the entire 12 weeks. Very occasionally it can be longer. What to expect in hospital. This is performed as an overnight stay procedure and usually under a General anaesthetic unless there are medical reasons to avoid this. It takes about two hours to do. You will stay in for 1 night or until your pain is controlled on tablet painkillers and you feel safe to leave. You will need someone to take you home. You will need an adult with you in the house for the initial 24hrs after going home. Your ankle may feel completely numb for 12-24hrs as the main nerves will have been surrounded in local anaesthetic (Nerve Block) to provide pain control. 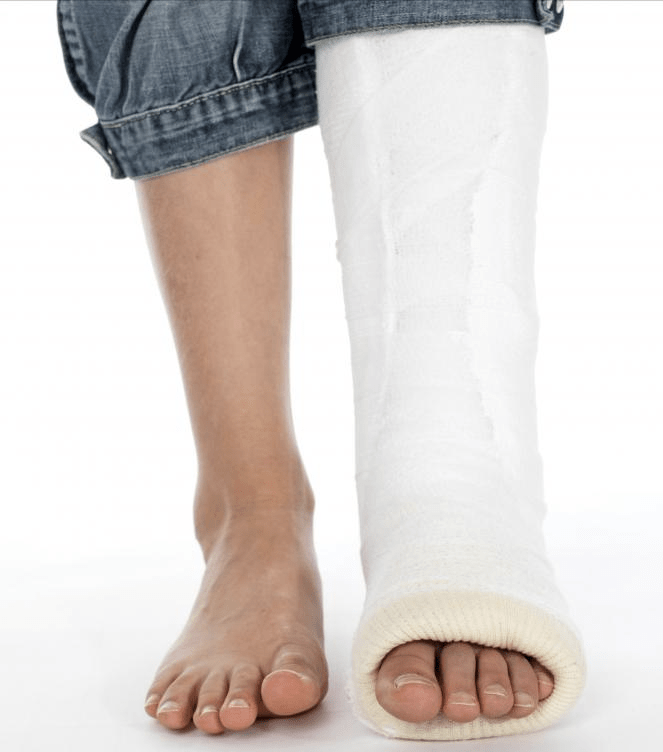 Your ankle will be wrapped in a ‘half plaster cast’ (Backslab) and should be comfortable with the use of tablet painkillers. You will be guided by the nurses on management of your bandages. You may have some thigh discomfort or bruising from the pressure of the tight band (tourniquet) used during the surgery to temporarily stop the blood flow to the leg and allow easier surgery. Your instructions regarding weight bearing will be explained to you by Mr. Williams or the physiotherapists. Wound check appointment with Mr. Williams. Physiotherapy Appointment to fit aircast boot usually same day. Recovery appointment with Mr. Williams to check progress and commence rehabilitation. At 2 weeks - They will fit the hard plastic boot and instruct on weightbearing and boot use. At 10-12 weeks and onwards - commence rehabilitation weaning out of the boot with gait re-education. What are the Risk of the Surgery? This surgery carries risks as we have to cut through your skin to work inside your ankle joint. The incisions are kept as small as possible (Keyhole) to minimise these risks. Bleeding / vascular injury– This is usually minimal and settles with rest and elevation. If blood ever visibly continued to leak out of the dressing you should contact the hospital. Infection – Arthroscopy fusion is associated with a low risk for infection. Superficial skin infection around the stitches can be managed with some antibiotics and rarely affects the overall outcome. Deep infection in the bone is more serious, can have a sustained effect on the outcome and occasionally require more dramatic surgery such as re-doing the operation or even amputation. This is fortunately very rare. If you notice at any point worsening pain, redness or worrying swelling of the ankle or ever start to feel generally unwell please contact the hospital. Nerve damage/ Neuritis - The small surgical wounds pass near nerves that supply sensation to your foot. Immediately after the surgery the scars and even foot can be a little numb and tingly. This usually resolves by about 6 weeks. Very occasionally it can be permanent with either loss of feeling, ‘pins and needles’ or a chronic ‘nerve’ pain occurring. Tendon Damage – The 2 small arthroscopy wounds pass very near the tendons that cross the ankle. Whilst naturally being careful there remains the inherent risk of slight damage to these tendons which can result in pain or rarely rupture. If you notice altered movements of the toes or foot please alert Mr. Williams. Delayed Union - – Despite a surgeons best efforts, this operation relies on your body growing new bone across the ankle joint. Occasionally this takes longer than usual requiring a cast or boot for further weeks to months. Non-union – Despite a surgeons best efforts, this operation relies on your body growing new bone across the ankle joint. This occasionally does not happen and a scar tissue (fibrous joint) forms instead. It presents as ongoing pain after the operation and can be seen on an Xray or Scan. If symptomatic the operation can occasionally have to be re-done. Adhering to the recovery instructions with respect to boot use and weightbearing can have a significant impact on this. Metalwork Problems – Large internal screws with washers are used to hold the bones compressed together at the end of the operation. They are designed to stay in forever. If you are allergic / sensitive to any metals– PLEASE LET THE TEAM KNOW BEFORE THE SURGERY. Occasionally the heads of the screws can be prominent under the skin and you may request for them to be removed later in the year once fusion is complete. Despite a surgeons best techniques occasionally the tips of the screws can puncture into a neighbouring joint and cause damage or pain such that they require removal. Breakage of instruments during the surgery. This may need the joint to be opened to have them removed. This is a very rare complication. Joint Malposition - The aim of the surgery is to set the ankle with your foot ‘square’ to the floor using both xray and experience to achieve this. Malposition can result in walking problems that require revision treatment to rectify it. Foot Joint pains – As mentioned previously the extra requirements placed on the foot joints can exacerbate or even cause arthritis in the foot in the medium or long term. Occasionally it can be sooner. Complex Regional Pain – Any operation on the foot or ankle seems to carry a small chance of this difficult and frustrating pain condition. It is usually not clear why it happens and there is little to predict it. Though rare, this chronically painful problem can be life affecting. It presents as pain around the ankle despite no evidence of technical problems, infection or therwise. Thrombosis – (Deep Vein Thrombosis / Blood Clot / Pulmonary Embolism). Any operation on the leg places you at slight risk of this. A thrombosis or blood clot can occur in the leg muscle veins causing pain and swelling. Pulmonary Embolism (PE) is where the leg thrombosis moves and traps in the lung which can be fatal. Wear a thrombosis prevention stocking (TED) which will be provided by the hospital. Take the prescribed injection or tablet to thin your blood for the entire time you are in a plaster cast unless specifically guided otherwise. Small area of the lung may collapse, which increases the risk of a chest infection. Stress of surgery can cause a heart attack or stroke. Immediate life-threatening events may occur during any surgical procedure, which may require life saving interventions. Increased risk of wound infection, heart and lung complications, and thrombosis are associated with OBESITY and/or SMOKING. All this information can be a little overwhelming so please do ask Mr. Williams about any concerns. Please write questions you may have down and we will always be happy to answer them prior to proceeding with any surgery.